Thank you for browsing my website. My name is Oscar van der Velde. I grew up in Bedum, The Netherlands, 10 kilometers north of Groningen. At age 18 (in 1995) I moved to Wageningen for my Meteorology studies, which I completed in 2002 (M.Sc.) after internships at KNMI (Royal Netherlands Meteorological Institute) and the University of Oklahoma (CIMMS) in Norman, OK (USA) specializing in thunderstorms and lightning. I defended my Ph.D. degree at Université de Toulouse (Laboratoire d'Aérologie) on sprites and gigantic jets in 2008. I work as postdoc researcher in the Lightning Research Group of the Electrical Engineering Department of the Technical University of Catalonia (Spain), in the city of Terrassa. My current home is in Castellgalí, Spain (province of Barcelona), with great views over the hills, National Park Sant LLorenç del Munt i l'Obac and the mountain Montserrat. 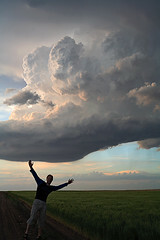 My hobbies are forecasting and observing thunderstorms and sprites, photography, and I am fascinated by cameras and optics, landscapes and the night sky, as well as electronic music, world music and some metal. Before 2006 I shot slide film including 6x6 medium format: Bronica S2a, Nikkor 75mm f/2.8, Komura 45mm f/4.5 super wide. Since 2006 I shoot with a Canon EOS 5D with the following lenses: Tokina 16-28mm F2.8, EF 28mm f/2.8, Sigma 20mm f/1.8, Tamron 90mm f/2.8 macro, Samyang 8mm f/3.5 fisheye, CZJ 35mm f/2.4 Flektogon, EF 75-300mm f/3.5-5.6 III, EF 50mm f/1.8. Since December 2014 a Fujifilm X-T1. For sprites and meteors I use a Watec 902H2 Ultimate, Computar 12mm F0.8 and 8-48mm F1.2 lenses, wide converter and GPS time inserter (for research purposes). Since July 2014, a Point Grey Grasshopper3 2.3 megapixel Sony IMX174 sensor with 25mm F0.95 lens. UFOCaptureHD software. For color photos of sprites: Canon EOS 350D (no infrared blocking filter). Also a Point Grey Flea3, Sony ICX687. High-speed video camera for lightning: Redlake Motionscope M1 (1000 frames per second, 640x500), 6mm F1.4 wide angle and 16mm F1.4 standard lens.